The Maryland affiliate has again partnered with Baltimore City Public Schools’ Summer Learning Academies to provide students with arts-integrated learning opportunities during the summer months. The Baltimore City program was designed to help students who score basic or below in their math assessments and are at risk for academic failure, by giving them five weeks of additional math support during the summer. As an incentive, this program also gives students free access to opportunities in the arts, sports, and robotics. Young Audiences artists are involved in both aspects of the program, working closely with rising fifth- through eighth-graders at 10 sites from July 1 to August 2. Each morning, Young Audiences artists work with classroom teachers to co-teach arts-integrated Math and STEM lessons, and each afternoon, lead arts enrichment sessions. During the duration of the program Young Audiences artists will serve approximately 150 students through this program. Supported by the Shaker Schools Foundation, this summer Young Audiences of Northeast Ohio is partnering with Shaker Heights High School’s Summer Academy program to offer music recording arts and digital storytelling to 25 incoming 9th grade students. Students enrolled in Summer Academy have poor academic records, yet high potential to succeed in high school and beyond. Teaching artists Dave Young and Jimmie Woody will work with students three hours per week for a series of five weeks to create mixed-media autobiographical stories through digital art, photography, film, music, poetry and spoken word. The Summer Academy will host a culminating event where students will have the opportunity to share their digital autobiographies with families, community members, and members of the Shaker Schools Foundation. This summer, Young Audiences of Louisiana partnered with the New Orleans Recreation Department to provide an engaging, summer experience for local youth ages 5-11 at the Lyons Center (624 Louisiana Avenue). 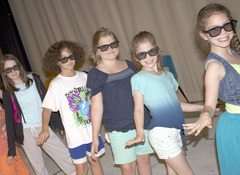 The summer camp which runs through July 26th, focuses on the visual and performing arts as well as S.T.E.M. (Science, Technology, Engineering, and Math). For more information. The Ennis Beley Photography Project is named in memory of an exceptionally gifted young photographer from South Central Los Angeles who discovered photography at the age of eleven and was killed in a drive-by shooting when he was only 15. Inspired by his story, this multi-week summer project, which teaches the art of photography, takes adolescents from urban areas on a creative and educational journey to discover and explore their creative talents and abilities while developing essential life and professional skills. Professional photographers lead students through the process of understanding digital photography as well as creating their own personal work for exhibition. The project culminates with a public exhibit of the students' work for families, friends and the community. This year, the program is taking place in Newark at the Marion P. Thomas Charter School. Students learn how to use a digital camera and use photo editing software, learn the history of photography, how to make a cyanotype and go on a field trip to experience and photograph nature. Lead teaching artist and professional photographer Will Ortega guides students through this 3 week program as the learn about the different photography concepts, create a portfolio of their work and select images for their exhibition in the fall. Learn more about this program. Young Audiences WNY maintains a full schedule of workshops for young people, both in and out of school. Summer programming at Canalside allows the public to experience workshops offered by Young Audiences’ roster of professional teaching artists. A complete schedule can be found at yawny.org/canalside. Themes include the Underground Railroad, local artists, and local history and architecture. Programming continues every First Friday at the Albright Knox Art Gallery, and third Saturdays in July and August at the History Museum. A full schedule of events can be found at http://www.yawny.org/content/public-programs. The ArtWorks Summer program is an intensive six-week workforce development program for high school students designed to develop students' 21st Century job skills through apprenticeships in the arts. Rising 10th, 11th, and 12th graders are hired to apprentice under a professional Master Teaching Artist in an art form of their choice. Apprentices work in small groups, called co-ops, of approximately ten apprentices under the guidance of a single Master Teaching Artist, occasionally with the assistance of an Assistant Teaching Artist. For six hours a day, five days a week, ArtWorks Summer apprentices create exciting original work in theater, dance, music, or visual arts. Master Teaching Artists mentor apprentices and teach them not only the specifics of an arts discipline, but also essential 21st Century skills that transfer to any workplace. Learn more about Compas' program (our affiliate in St. Paul, MN), Arts for Learning Miami, and Young Audiences of Northeast Ohio. Dive into a dynamic summer art program. The art programs range from a teen hip hop class to a sampler program for younger kids (ages 5-7) and provide students with a well-rounded and exciting experience in four different art forms: music, drama, creative movement and visual art. All classes are taught by professional teaching artists, who develop interactive, age-specific curricula that promote teamwork, confidence, and creative expression. Young Audiences of Abilene (Texas) is celebrating its 17th Summer Library Performance Series featuring a variety of special performances from acts such as Nancy Burks Worcester, a ventriloquist from Granbury and a local storyteller, Gary Varner. The series will conclude on July 16th with Storybook Theater's perfromance of "Goldie Fox and the Two Hares". Performances are for people of all ages.